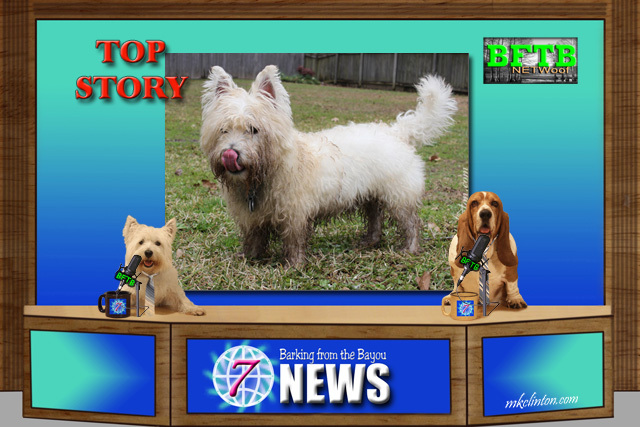 Pierre Westie: “Our first story serves as a warning to all of our furry friends in Britain. Authorities are urging dogs to avoid getting in the mud due to a deadly disease known as Alabama Rot. There have been 29 deaths so far this year, so it is necessary to take some precautions. Avoid mud if possible but if your dog does get muddy, wash it off as soon as possible. Check for any lesions or wounds and if you find one, go immediately to the veterinarian. Pierre: “One of the hardest things about volunteering at a shelter is seeing dogs and cats passed over due to age, looks, or being timid. Then, someone comes along and falls head or heels in love with that loner and you want to shout with joy. That is the story of Ember, a dog in Florida who spent over 600 days waiting for the perfect home. She was found wandering the streets and suffering from allergies which caused her to lose most of her hair. 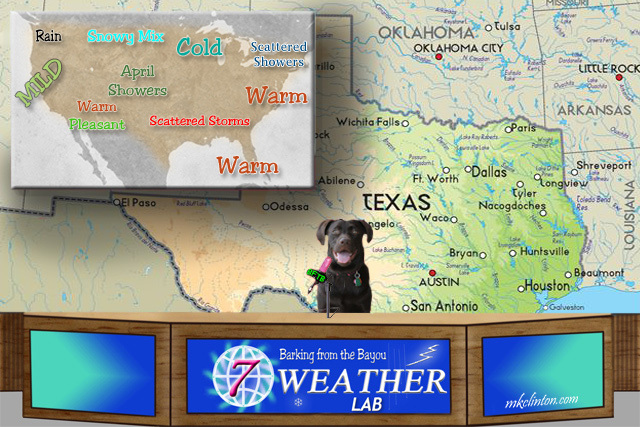 Paisley the Weather Lab: “Speaking of fair, is it time for this week’s weather report? Let’s practice the old saying about April showers bringing May flowers because we have a LOT of showers across the United States this week. The exception will be with our friends in the north who can expect a mixture of snow and rain! If you are on either coast, you are in for some warm to mild temperatures. Here in the south along with the center of the country, we are likely to have scattered storms and more of those April showers. Bentley: “We did learn last week that I am not a fan of thunder here in Texas either. Hopefully, our upcoming storms will be quieter. 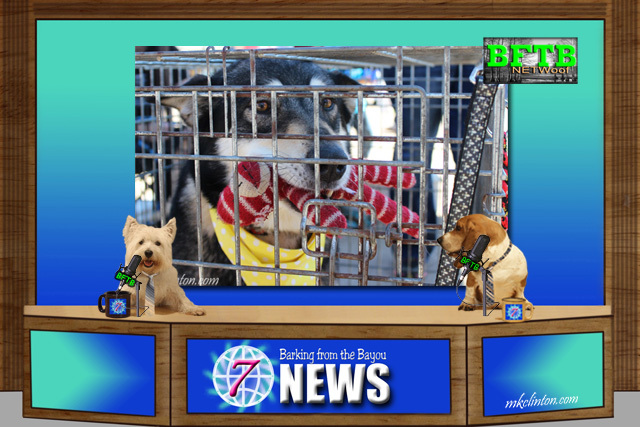 You can count on us barking about some fun things this week including some tasty treats from Chewy.com and Pierre is showing off his newest PrideBites product! We are sure that you’ll love both reviews. It is also National Pooper Scooper Week, so we will share some important tips on taking care of your dog’s business. The Returns and The Returns 2~Showstoppers are available on Kindle and FREE to Kindle Unlimited members. It is not the happy stories that we enjoy reporting but when it is concerning health alerts, we make an exception. 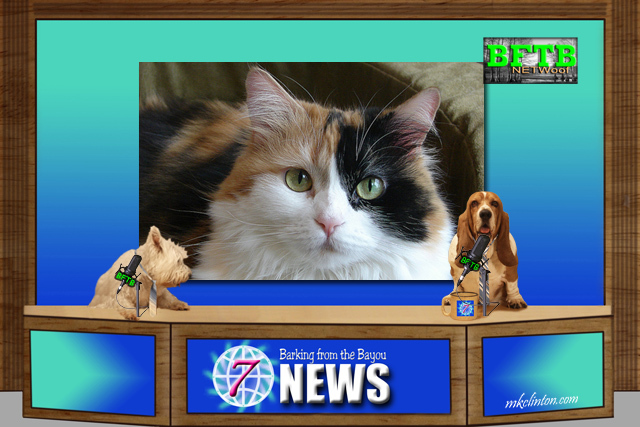 We don't think that is fair about the cat in the cat shows, but shows have very strict rules and we are not surprised. Just another reason Mom has no interest in showing any of us. Have a great week. We think the cat should be allowed to win. I also think spayed and neutered dogs should be allowed to compete but I don't expect that to change either. This Alabama Rot sounds horrible :-( Dawntreader sure is a handsome kitty! It is a very scary report but important to share. We feel for the handsome calico. That Alabama Rot story is incredible, and not in a good way. We hope there are no more cases. As for the Cat Fanciers Association, we stand by the notion that was decidedly not fair and seems gender discriminatory. No doubt there will be litigation regarding their decision. Very happy to hear of the pet who after 600 days has finally found their fur-ever home. Never give up, indeed! The report on Alabama Rot was upsetting. I'd never heard of it before. We discussed that the cat was definitely discriminated against. What a collection of reports this week. 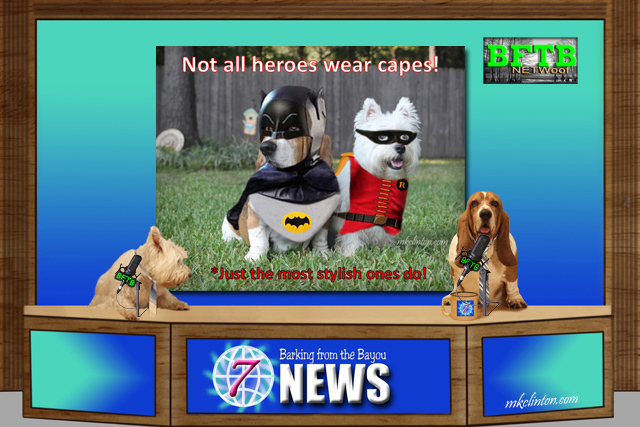 Scary Alabama Rot, silly show rules and the feel good FURever home! Love tuning in every week. Thanks, Denise! We love having you visit. We are so glad you dropped by to visit. The calico male should be allowed to be best in show, he is gorgeous. We agree. You can click on the news source link to see the actual Dawntreader. That is pretty scary stuff! I sure did enjoy the pups Easter photos. Cat fancier should be A S H A M E D!!! Dawntreader is most handsome and for sure should win an award for most amazingly genetic trait not be held back because of it. We agree 100%. He should be celebrated for his uniqueness. Poor Dawntreader!! We can't believe they won't let such a beautiful boy be best in show!! Some rules need to be challenged. Lady says she will only get older pets if she gets anymore. It makes her sad they can't find homes. I have given serious thought to adopting an older pet when we decide to add to our family. That is a long time to wait in a shelter environment. I'm so glad she has a forever home. Gosh, we're relieved that the Alabama Rot is not in our area, because avoiding mud around here is virtually impossible this time of year! Considering the name, we wonder if it is in the US though? At least it sounds not too common, which is good news for those in the UK, though still worrisome. We don't agree with the cat show thing either, but like Emma says, it's not surprising. So many organizations are unwilling to bend their rules at all. Holy cow, that Alabama Rot is scary stuff! I sure hope it doesn't make it's way over here from the UK. I think the male Calico cat ruling is unfair, why shouldn't he be able to be a champ? ?